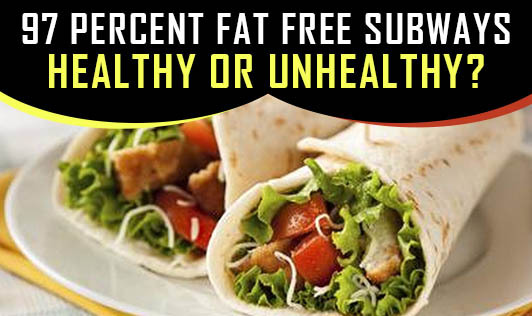 97 Percent Fat Free Subways - Healthy or Unhealthy? Ever wondered why Subways are one of the leading chain restaurants and competitors to other eat outs like Mc Donald's, KFC's, etc? Yes, as most of you know, it is a great place for the sandwich lovers which offer a wide array of popular local and international favorites with recently introduced 97% fat free items like veggie delight, veg shammi, Italian BMT, tuna sub, chicken teriyaki etc. The above options available in subway claim that it is 97% fat free, as is well suited to India's growing health and wellness. The 97% Fat free subs feature as low fat and are exclusively prepared with gourmet-inspired sauces which can be used to compliment any of its sandwiches. There are also options for stuffing (chopped veggies, roasted chicken, mayonnaise, cheese, jalapenos, tikkis, baked soya pattice etc) and breads (multigrain, honey+ oats, oregano etc). Say, when you choose from the menu, for example: Veg Shammi or Chicken subz, you meet that meal's requirement with carbs, small quantity of proteins and vitamins and minerals through sprinkled fresh veggies. These subs you think may be a nightmare to the dietitians and nutritionists. But in reality if you consider all the aspects, even though the calories are equal to either of the day's meal, you would lack in proper balanced diet. For example: where do you go for a protein source as an option to vegetarian items like veggie delight or subway club? How many of you can actually agree, that your nutrition in terms of carbs, protein, fat, fiber, vitamin and minerals for a meal is adequate by just consuming 6" inch regular subs? The 97% Fat free subs can be consumed for convenience and time but not a regular meal option. Here is the calorie information on some of the 6" inch, 97% fat free subz. However with subways mushrooming all over and life getting as fast as it is today, it still may be considered a better choice than the majority of other fast-food sandwiches. If you are choosing subway to the regular food, be wise. Be careful not to add cheese and/or mayonnaise as extra toppings to these 97% fat free sandwiches where the calories and fat level can be within the limit. Therefore, Think.... Halt... and Step.... into Subz as your occasional meal replacement option!! A dietitian's thumb rule- Always try to make your palate healthy and balanced through natural foods to make it into a healthy eating lifestyle! !